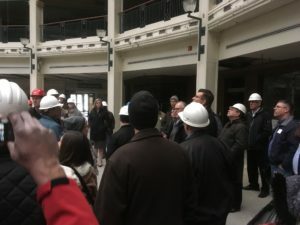 Historic preservation, downtown revitalization and innovative economic development were combined when the Miami Valley Section of APA Ohio, AIA Dayton, AGC, West Central Ohio Division and CSI Dayton/Miami Valley met together on March 22, 2018 to examine the redevelopment of the historic Dayton Arcade. The event culminated with a tour of the buildings that make up the Arcade complex, a full city block with 330,000 SF of mixed use space. Downtown Dayton is one of the primary economic engines for the Dayton region with more than 40,000 students, 7,500,000 visitors, 20,000 residents and 50,000 employees generating more than $7B in annual business revenues. The Arcade, which closed 26 years ago, is poised for revitalization. The redevelopment project leverages increasing economic investment in downtown, stimulates robust activity in the Central Business District and strengthens the economic vibrancy of Dayton and Montgomery County. 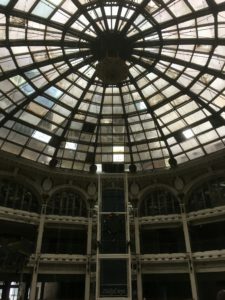 The Arcade redevelopment leverages Dayton’s globally recognized history of innovation while designing a vision for the future that incorporates the energy of the current generation of entrepreneurs and creative professionals. The key to the redevelopment project is The Arcade Innovation Hub (HUB). Led by a joint venture between The University of Dayton (UD) and The Entrepreneurs Center (TEC), the HUB will be a powerful catalyst for the future of our Region’s innovation economy The HUB envisions a live-work-play space for startup creation and growth that will coexist with artist’s housing, retail amenities, active streetscape environments and community event space incorporating the iconic Rotunda. The HUB is just the latest example of how the Dayton Region is working together to evolve our economy to the changing patterns of growth and development. In downtown Dayton, programs supporting entrepreneurial networks like “Start Downtown” are backed by organizations like the Dayton Development Coalition, the Air Force Research Laboratory, and the Wright Brothers Institute, plus UD and Wright State University. This broad community buy-in leverages access to world-class research facilities, ongoing commercialization programs and intensifying efforts to retain thousands of educated young talent from our region’s higher learning institutions. Discuss the impact of the deteriorated condition and specialized construction of the building complex on design, code compliance and building costs.